Atidos is a luxury Bed and Breakfast in the varied hinterland of the Costa Blanca. The B & B Atidos located on a hill in the outskirts of the charming provincial town of Ontinyent (in the province of Valencia). Valencia province has the most stable climate of Spain; it is very pleasant throughout the year. The environment of Atidos is very varied. In the west (inland) there is a mountain landscape also known as Tuscany of Spain, in the east are the glorious sandy beaches of the Costa Blanca. The beach is less than fourty minutes away. Between the mountains and beaches there are vast forests and fields, orange / olive groves and vineyards, impressive nature and culture. is a luxury villa and has three guest rooms. Two luxury rooms in the villa and a chalet, all with private bathroom and toilet. Each room has a double bed, 2 meters long and 1.60 / 1.80 wide. The rooms are furnished by our own interior designer and are fully equipped. All rooms have their own air conditioning and hot water. A cold shower because other guests have made the water is not an option here. 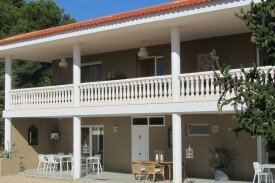 Room AD and Room AC 99,00 euro prices includes breakfast for 2 persons. Room AM 120,00 euro prices includes breakfast for 2 persons. Four times a week on Tuesday, Thursday, Saturday and Sunday. No experiences yet with Atidos. Be the first! Did you stay in Atidos? Let us know what you thought about it and help others to make the right choice! * I confirm having stayed in Atidos. 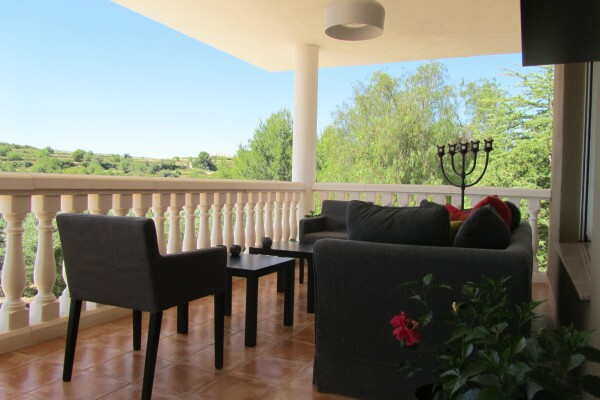 Find other bed & breakfasts in Ontinyent or all bed & breakfasts in Valencian Community.